Pumpkin crème brûlée is the perfect dessert for fall and winter. With its creamy interior, hard caramelized sugar coating and warm pumpkin and spice flavors, this tasty twist on a classic can take your dessert to the next level. Crème brûlée with pumpkin is a variation of the classic crème brûlée dessert. The flavors are warm, earthy and spicy, yet it still retains the silky cream custard and bittersweet caramelized sugar crunch of the original upon which it is modeled. The variation is in the addition of pumpkin and pumpkin spices like cinnamon and nutmeg. Some variations also add maple flavoring to make the dessert even richer and more satisfying. Pumpkin is traditionally considered a fall or winter flavor because pumpkins are harvested in the fall. It is also typically associated with Thanksgiving, and the pumpkin flavored version of crème brûlée makes a perfect sophisticated substitute for pumpkin pie for your Thanksgiving or holiday dessert. It can also make any regular meal more special. Best of all, it isn't that difficult to make. Typical ingredients include heavy cream, eggs, canned or fresh pumpkin purée, vanilla, cinnamon and nutmeg with granulated sugar for a topping. Making this dessert isn't difficult if you have the right supplies and follow a few simple cooking techniques. It is best if the crème brûlée is made the day before it is served and has the overnight time period to settle in the refrigerator and chill. Add milk and heavy cream to a saucepan. Split the vanilla beans in half lengthwise and scrape the seeds into the milk cream mixture. Place the saucepan over medium heat and heat the cream/milk mixture until it just begins to bubble around the edges. Remove the pan from the heat and set aside to cool slightly. While the cream cools, crack the egg yolks into a medium bowl. Set aside the egg whites for another use. Add one cup of sugar to the yolks and whisk the two together until well blended. Starting with a tablespoon at a time, whisk the milk/cream mixture into the egg yolks. Adding the hot cream in small amounts tempers the egg yolks and keeps them from cooking. Add the cream mixture slowly, whisking constantly, until it is fully incorporated. Add the pumpkin purée and whisk until smooth. Pour the mixture into eight six-ounce ramekins. Set the ramekins in the water bath with water up to mid-height on the ramekin. Place the water bath into the preheated oven. Bake for 35 to 40 minutes, until the custard is nearly set. The custard should still have some jiggle in the center but be firm around the edges. Remove the ramekins from the water bath and allow them to cool on a wire rack for about 30 minutes before refrigerating overnight. 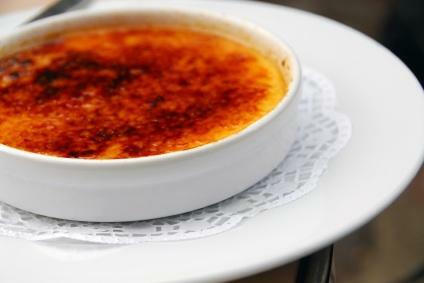 When it comes time to serve the crème brûlée, sprinkle sugar across the top of the custard in each ramekin. If you are using a kitchen blow torch, caramelize the sugar by lightly sweeping the torch across the sugar in each ramekin until it melts. Otherwise, place the ramekins on a baking sheet and place under the broiler for about three minutes to caramelize the sugar. Watch the ramekins closely to avoid burning the sugar. Serve immediately. If you know the proper techniques then it isn't difficult to cook pumpkin crème brûlée. Give it a try, and then be ready to enjoy the delicious, creamy flavors of this dessert.